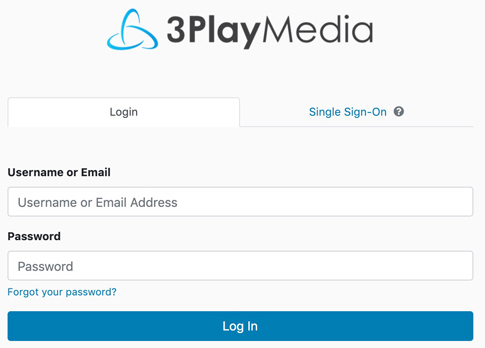 Follow the steps below to link the Brightcove Player to your 3Play Media account to set up the closed captioning integration. IMPORTANT NOTE: Please note that a transcoding/ingest profilemust be set up within Brightcove in order to convert media files to mp4. For more information visit this Brightcove support page. 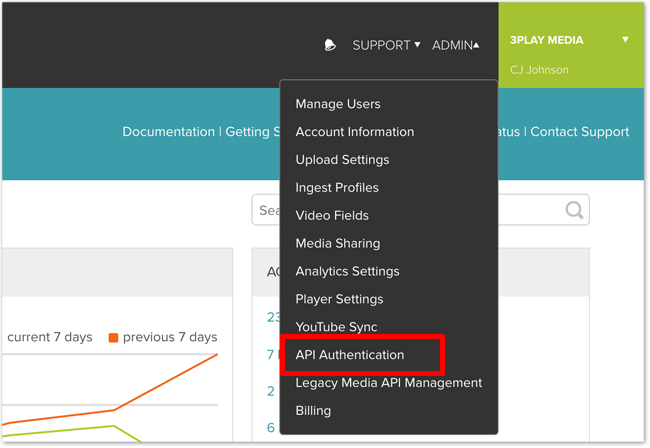 Click on the Settings icon and from the drop-down menu that appears select API Authentication. Note: Only Brightcove account administrators can access the APIAuthentication section. From the API Authentication page click Register New Application. Enter a Name and a ShortDescription of your choice in the available fields. Choose the account for authorization from under Available Accounts and add them to the Selected Accounts column. Please Note: Only ONE account can be selected per API Manifest. In the section Exposed Brightcove APIs check the boxes Playlist Read, Playlist Read/Write, Video Read, and Video Read/Write under the CMS column. Under Dynamic Ingest check the boxes next to Create and Push Files. 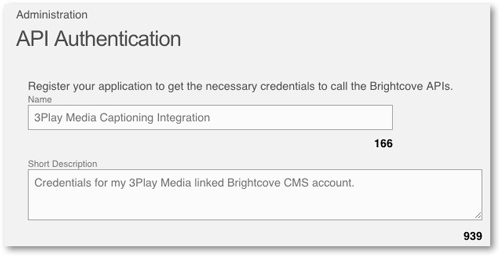 Click Save once you have entered the required information and selected the required Brightcove CMS APIs. Once Save is clicked the Client Secret and Client ID will be displayed. Copy the Client Secret and Client ID. IMPORTANT: Save the Client Secret and Client ID for future reference as these credentials only will display once!! 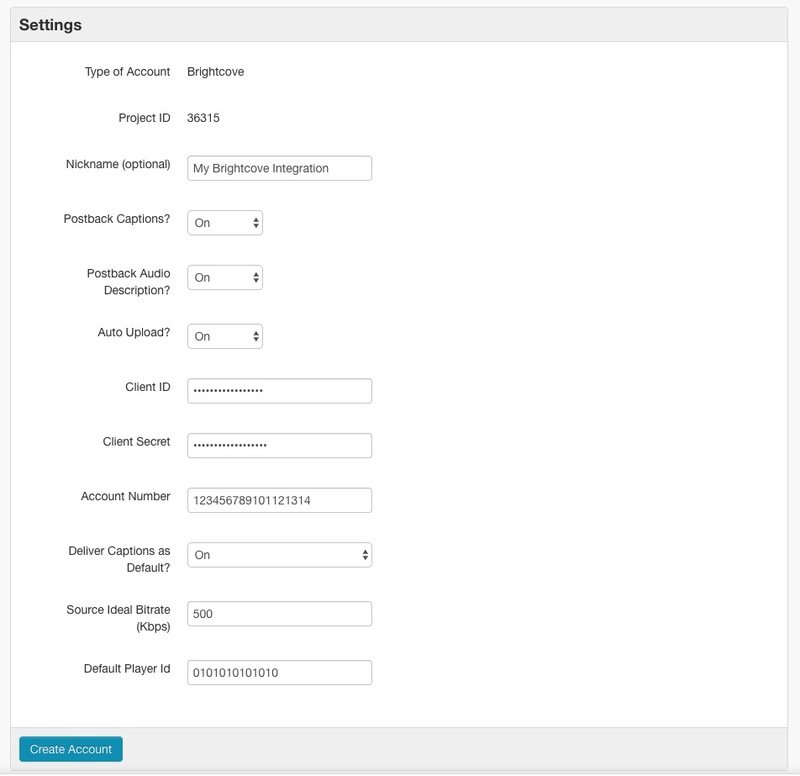 In Brightcove click Admin and from the drop-down menu select Account Information and note the number listed under Account. Please note that only users with Admin access will be available to navigate to this part of the Brightcove account system. 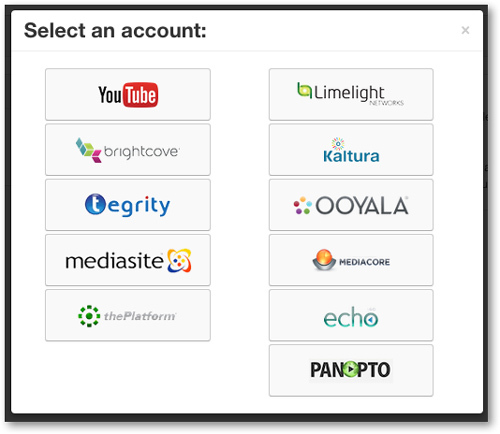 Click the Brightcove icon from the list of video platforms and lecture capture systems. 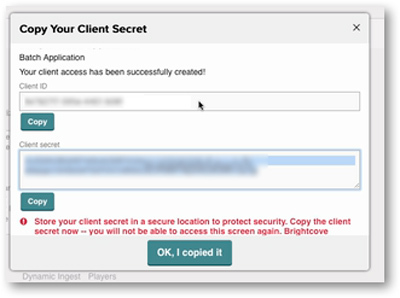 Enter the Client ID, Client Secret, Brightcove Account Number, and Nickname (optional). Turn Postback Captions to On to have captions, upon completion of the transcription process, automatically sent to and associated with the Brightcove assets. While translation requests can only be made directly from the user's 3Play Media account, upon completion of the translation process, the subtitles also will automatically postback to Brightcove. Turn Auto Upload to On to enable the ability to submit caption requests directly from Brightcove. 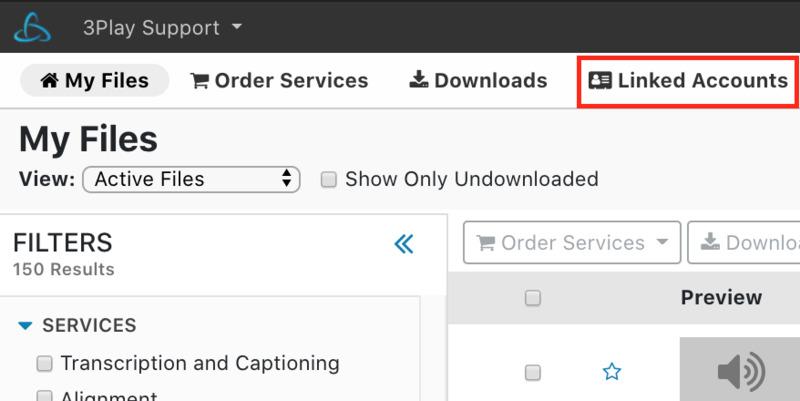 Turn on Deliver Captions as Default to set the caption file returned by the automatic postback as the default caption file for the media asset. This setting is useful if you plan on having multiple subtitle translations on the media asset, but may interact with some Brightcove players such that the track selected as 'default' will play automatically upon player load. To disable this, either turn off the Deliver Captions as Default setting, or consult the Brightcove documentation here.